Smith and Twitter Chief Operating Officer Anthony Noto joined Ad Age Editor Brian Braiker for a discussion on how their two companies are partnering to do that. Bloomberg’s global social live breaking news network will “marry Twitter’s speed and scale with Bloomberg’s global newsroom judgment,” said Smith. Twitter, of course, is now one of the world’s primary news distribution channels, with more than 300MM monthly average users. 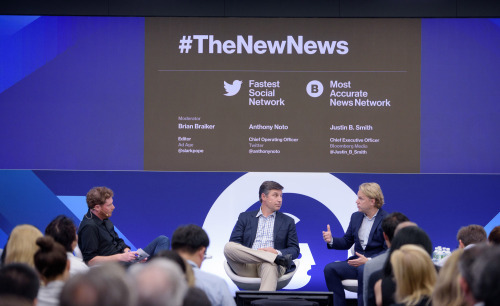 The new live news network will serve that audience with breaking news and intelligent information that is vetted and verified by Bloomberg’s data-driven, non-partisan global news organization. With more than 2,700 journalists and analysts on the ground in 120 countries and television studios worldwide, that adds a critical human layer. “Think of it as an expert guide walking you through the latest news, comments, data and video,” Smith said – all with Twitter’s interactivity and citizen journalism built in. The partnership grew from remarkably successful experiments, Smith and Noto said. That includes live streaming the 2016 Presidential debates and former FBI Director James Comey’s congressional testimony this summer. “When we did the debates, you could see the conversation come to life,” Noto said, with additive commentary from across feeds appearing alongside the co-branded programming. More recently, a live stream of last week’s Bloomberg Global Business Forum – introduced this year as the successor to the Clinton Global Initiative – attracted 3.9MM viewers on Twitter, Smith said. Goldman Sachs, Infiniti, TD Ameritrade and CA Technologies have inked deals to advertise on Bloomberg’s forthcoming Twitter-only network, a project announced by the two companies in May. Bloomberg has been looking for sponsors to not only serve ads during breaks but be part of the content that will fill the nonstop news engine. Bloomberg Media CEO Justin Smith says the companies have been working closely, engineer to engineer, to develop what he’s pitching as a new kind of media. To do that, Twitter and Bloomberg Media will use both art and science. “The most powerful thing we have is that we know what people want because of who they follow,” said Noto. That allows the company to build mechanisms that are creative, customized, and relevant. Smith added: “We’re hiring out of the box thinkers and allowing all ideas to get a hearing,” fostering an innovative approach focused on continually evolving the new network as it launches and grows. At launch, users will see an extraordinary mix of user-generated breaking news video from citizens, curated and verified by Bloomberg editors, together with live video and reporting from Bloomberg journalists around the world. It will be both fast and filtered, both distilled and in-depth. And it will be easy to use, graphic and readable on any device.